How easy was that ?! A long weekend Buy Nothing New Month success story. My husband & I had the long weekend to ourselves in town – our kids were away visiting grandparents. The ONLY purchase made over the entire 3 days was a single bike tyre! As I said in the first “Adelaide’s Buy Nothing New Month” blog I thought making essential purchases like food, toiletries, medication, etc was a fair exclusion from the exercise – don’t think they need to count. Perhaps next year the rules might change a little for essentials (depending on this month’s efforts). We definitely considered the tyre to be essential. It was bought to replace a flat I discovered on my bike (of course found once we were an hour out of the city). It was really satisfying to have that tyre be the only “something new” and better still, that the weekend was spent without deliberate restraint, effort or sense of “doing without”. For the 3 day weekend, we decided to stay local. After looking at websites of quaint rural tourist towns and places on our love-to-see list we realized accommodation would be hard to find, we’d have to jostle with others who were also looking for “a quiet weekend away” and overall we would be just as relaxed and happy having a “staycation“. 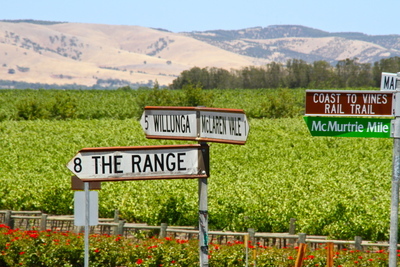 We did take a day trip to McLaren Vale (Photo courtesy of Weekend Notes blog). That’s where the bike tyre was purchased. Thanks local bike shop ! We rode for almost 3 hours along some gently rolling trails, through vineyards, suburbs, sometimes with views of the sea. We didn’t feel any time pressure. Another day we were fortunate enough to go offshore in a friends boat for a few hours, mostly just bobbing about & talking and for half an hour (on the way home) we were lucky enough to pull in a few squid – which we cooked for dinner! I want to suggest here that shopping is sometimes a convenience, a habit. That sometimes when some people are just not sure what to do with themselves, they shop. Could this be true? We found by physically removing ourselves from commercial spaces, by being well immersed in “recreation”, by not feeling time-poor, by hanging out with friends in simple locations with a little something to do to keep us occupied, by not looking actively for “entertainment” we were well entertained and the thought of shopping (for anything!) was the furthest thing from our mind.